Objective: To compare the efficacy of Clarithromycin versus Methylprednisolone in the treatment of non-eosinophilic and eosinophilic nasal polyposis. 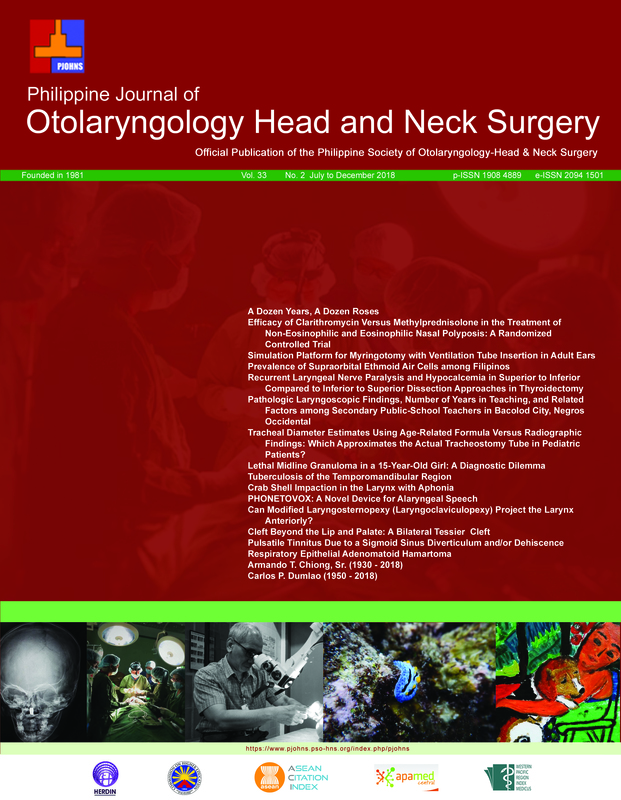 Subjects: Forty two patients with Chronic Rhinosinusitis with Nasal Polyps (CRSwNP) were grouped into non-eosinophilic and eosinophilic groups after biopsy determination of eosinophil count. Both groups were further randomized into a treatment arm given Clarithromycin (CLA) 500 mg/ day and another arm given Methylprednisolone (METH) 32 mg/ day tapering to 8 mg/ day for 15 days. All participants underwent pre– and post–treatment evaluation via anterior rhinoscopy, Sino-Nasal Outcome Test (SNOT-22) and Endoscopic Appearance (EA) Scoring. Data were encoded and subjected to statistical analysis using Mann-Whitney U test. Results: For the 9 participants in the non-eosinophilic group, 4 were given CLA and 5 were given METH. The CLA arm showed significant improvement in SNOT-22 scores by the 15th day (p= .007). The METH arm did not demonstrate significant improvement by the 7th (p= .44) or 15th day (p= .22). Comparison of the improvement in SNOT-22 scores between the two arms showed that on both 7th and 15th days, CLA outperformed METH (p= .026 and p= .004, respectively). For the EA scoring, both the CLA and METH groups significantly improved by the 7th (p= .027 and p= 0.017, respectively), and 15th day (p= .013 and p= .027, respectively). Comparison of the improvement in EA scores between the two arms showed significant difference on the 15th day (p= .01), with the CLA performing better than METH. Overall, the results suggest that the CLA arm performed significantly better than the METH arm in the treatment of non-eosinophilic patients. Of the 33 eosinophilic patients, 17 were given CLA and 16 were given METH. The CLA arm showed significant improvement in SNOT-22 scores by the 15th day (p < .001), while the METH arm on both 7th (p= .033) and 15th day (p< .001). Comparison of the improvement in SNOT-22 results between the two arms showed no significant differences (7th day p= .494; 15th day p= .587). For the EA scoring, both treatment groups showed significant improvement by the 7th and 15th day (p< .001). Comparison of the improvement in EA scores between the two arms showed significant differences (p< .001) on both 7th and 15th day, suggesting that METH was more effective than CLA. Overall, the results showed that both CLA and METH were effective in the treatment of eosinophilic nasal polyps. However, METH was significantly better than CLA in terms of superior EA scores. Conclusion: In terms of improving symptoms and well-being, as well as decreasing nasal polyp size and reducing discharge and edema as reflected in superior SNOT-22 and EA scores, Clarithromycin was significantly more effective than Methylprednisolone in the treatment of non-eosinophilic nasal polyps. While both Clarithromycin and Methylprednisolone were shown to be effective in the treatment of eosinophilic nasal polyps, Methylprednisolone was significantly better than Clarithromycin in terms of superior EA scores. A biopsy for tissue eosinophil cell count prior to treatment is recommended to establish the predominant inflammatory cell in nasal polyps in order to provide appropriate targeted treatment, i.e. Clarithromycin for non-eosinophilic nasal polyps and Methylprednisolone for eosinophilic polyps.